Following the Supergirl post, I was in a superhero fashion re-design kinda mood. 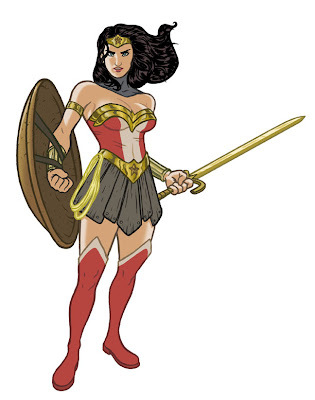 Here's one take I had on DC's Wonder Woman character. Thought I'd try and play around with giving her more of a warrior look, as opposed to American flag undies. Really this was all inspired by Dean Trippe's nifty Project:Rooftop site, where artist's submit their own redesigns of existing comic book characters. wow. this is really great! did you submit it to P:R?